A few km away from the city of Arezzo, ideal place to visit Tuscany. 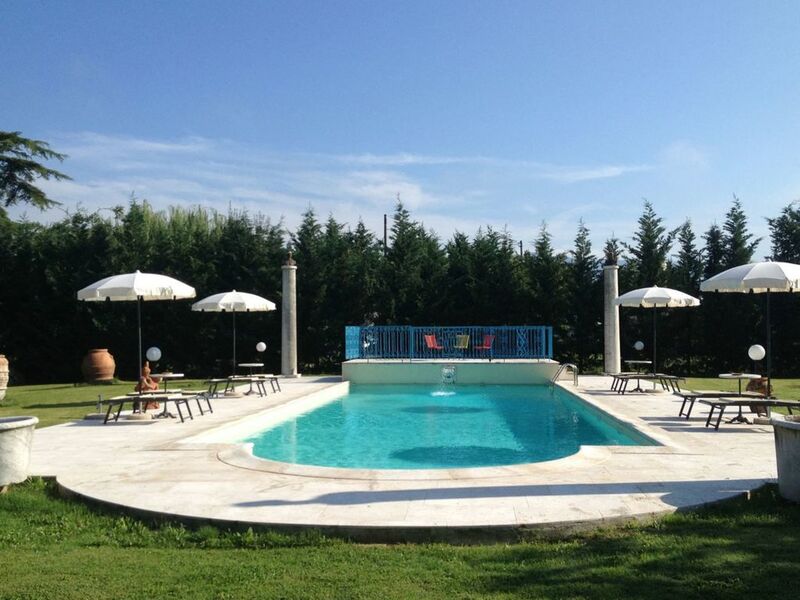 Villa Quattro Mori is situated only a few km away from the city of Arezzo and around 500 m. outside the small village of Tregozzano and in the past years was residence of an ancient and noble family of Earls of Arezzo. Arezzo, beautiful art town which counts, among the others, the masterpieces of Piero della Francesca such as the Legend of the True Cross, is only 7 km away and easily reachable with the public bus, or in 5 minutes driving through the provincial road which pass by the villa. The city of Arezzo is moreover endowed with elegant shops, supermarkets, restaurants and services of all kind. In Tregozzano, reachable on foot, you will find a bar, a pharmacy and some small grocery shops. Just outside the village there is also a typical trattoria. Due to its closeness to the city of Arezzo and the main communication routes, the villa is the ideal place to visit Tuscany and the centre of Italy. The characteristic atmosphere of a Tuscan residence. At guests' disposal a marvellous walk-in swimming pool with Roman steps (size m. 16x6, depth m. 1,40-2,00), adorned with valuable marbles and endowed with dressing room and bathroom with shower, a wide fenced garden shaded by centuries-old pines with a characteristic pergola covered up with wisteria and roses, with a marble fountain and wooden benches to sit and relax in the fresh air. Next to the entrance stairs we find and airy and large glass veranda with a beautiful billiards, table football and equipped with dining table, fridge and sofas. Furnishing, enriched with antiques is comfortable and well-groomed, and gives to the house the typical atmosphere of a Tuscan residence. GROUND FLOOR: wide and bright glass veranda with billiards, dining table, table football and sofas. FIRST FLOOR: with access through external staircase, entrance, wide and bright living-dining room with sofa and balcony, kitchen, three double bedrooms, twin bedroom, bathroom with bathtub, bathroom with shower. Bathroom with shower and dressing room at the swimming pool. EQUIPMENT: freezer, oven, dishwasher, washing machine, microwave, moka coffee maker, filter coffee maker, toaster, iron and ironing board, Wi-Fi Internet access, high chair, barbecue, TV, table-football, billiards, fans (n.4), hairdryer. Très belle location avec un grand jardin bien cloturé et une superbe piscine de 16 m très propre. Grande villa parfaite pour 8 personnes. Proximité d'Arezzo et de commerce. Le propriétaire Marco est très sympathique et parle trés bien anglais. Die Villa und das Anwesen sind sehr groß. Der Pool ist absolut spitze. Fängt bei ,1,40m an und geht schnell auf die Tiefe von 2,00 m. Ideal zum schwimmen. Am Pool befindet sich ein WC und eine Dusche. Das Anwesen ist von aussen nicht einsehbar. Für Personen die auch mal schattige Plätzchen suchen ist diese Location ideal. Unter der Villa gibt es eine Terasse mit Kühlschrank und einem Tischfussball. Neben dem Aufgang zur Villa gibt es einen Grillplatz auf dem Grundstück. Es war sehr schön dort. [English translation courtesy of Easy Reserve] The villa and the property are very big. The pool is absolutely great. Begins at 1.40m and quickly goes to the depth of 2.00m. Ideal for swimming. By the pool there is a toilet and a shower. The property is not visible from the outside. For people looking for shady spots, this location is ideal. Under the villa there is a terrace with a fridge and a table football. Next to the staircase to the villa there is a barbecue area on the property. It was very nice there. Very good place, good location. Marco is a good host, great pool. Only the mosquitoes, but they are in all h the other places we have visited. The villa was very good an we enjoyed the days there. The only negative aspect was the loud street!